A Vane Pump is a particular type of positive displacement pump. Its principle of operation is to use the back and forth movement of rectangle shaped vanes inside slots to move fluids. 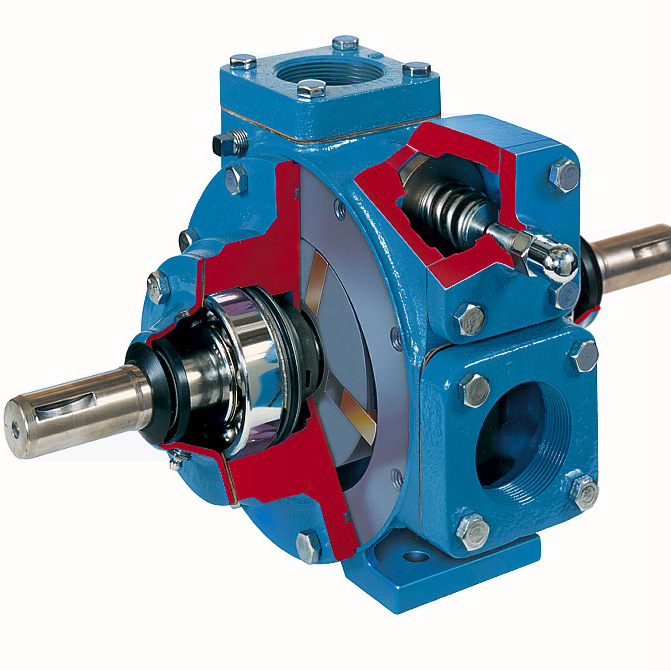 They are sometimes also referred to as sliding vane pumps. The simplest vane pump consists of a circular rotor rotating inside of a larger circular cavity. The center's of the two circles are offset, causing eccentricity. Vanes are allowed to slide into and out of the rotor and seal on all edges, creating vane chambers that do the pumping work. On the intake side of the pump, the vane chambers are increasing in volume. These increasing volume vane chambers are filled with fluid forced in by the inlet pressure. Inlet pressure is actually the pressure from the system being pumped, often just the atmosphere. On the discharge side of the pump, the vane chambers are decreasing in volume, forcing fluid out of the pump. The action of the vane drives out the same volume of fluid with each rotation. Usually, the pump mechanism comprises of a cylindrically shaped rotor rotating inside an asymmetrically shaped casing or cavity. The cylindrical rotor often has a number of rectangle shaped slots running linearly along the outside of the cylinder. As the rotor turns, centrifugal force causes the vanes to move outward, such that the outer edge of the vane stays in touch with the inside surface of the asymmetrically shaped casing. In some cases the vanes can be tensioned. The asymmetrical shape of the casing causes the vanes to move in and out of the slots as the rotor turns. As the vanes move past the suction port of the pump, a vacuum is created. This vacuum is what draws fluid into the pumping chamber. The fluid then moves between the vanes, and is eventually forced out the discharge port of the pump. Like many rotary pumps, the direction of the fluid flow can be reversed by reversing the direction of rotation of the pump. How do magnetically coupled pumps work? Vane pumps can be used in many different positive displacement applications. They can handle thin and low viscosity liquids, like water and petrol. They don’t work particularly well with highly viscous fluids, as the higher viscosity prevents the vanes from moving freely in the slots. Due to the fact that they can handle a wide range of viscosities, Vane pumps are often widely used for fuel loading terminals, fuel transport vehicles, solvents, alcohol and even soft drinks and syrups. Vane pumps are available in many different configurations and can also handle fluids with a wide range of temperatures and pressures. Since they often are used for pumping clean hydrocarbons including gas and light oils, vane pumps are normally constructed with ductile iron casings and metal rotors. The vanes are often made of carbon, which exhibits a good lubricity to keep the vanes sliding inside the slots and against the inside surface of the casing. The type of fluid being handled plays a large part in whether this pump is right for a specific application. High-viscosity or thicker fluids will obviously greatly reduce the speed of the pump — and a therefore vane pump might not be the best choice. In some cases vane pumps present a good alternative to gear pumps for pumping relatively low viscosity oils.